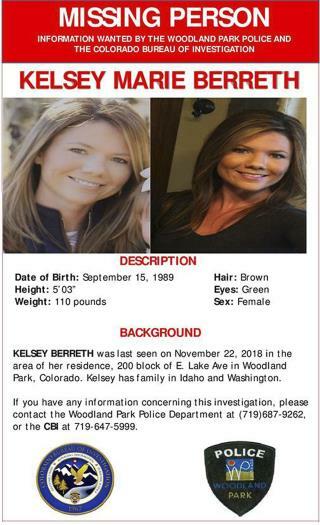 (Newser) – Kelsey Berreth wasn't reported missing until Dec. 2, but she was last seen in public on Nov. 22—and police recently revealed that text messages were sent from the 29-year-old Colorado mom's phone three days later. Berreth's last known location was a Safeway in her city of Woodland Park where she was captured on surveillance video shopping with her daughter, Kaylee, at 12:22pm on Thanksgiving Day, CBS News reports. Patrick Frazee, her fiancé and Kaylee's father, met her there to pick up the 1-year-old. Berreth hasn't been seen since, but on Nov. 25 her cellphone pinged almost 700 miles away, near Gooding, Idaho. Two texts were sent: one to Frazee and one telling her employer, Doss Aviation, that she wouldn't be at work the following week. It's not clear whether it was actually Berreth who sent the texts, Fox News reports, but she hasn't been heard from since. Fiance' Guilty,case closed,sentence him now! She has no family in the area and wasn't spending Thanksgiving with her fiance or daughter, who were together? This stinks to high heaven.